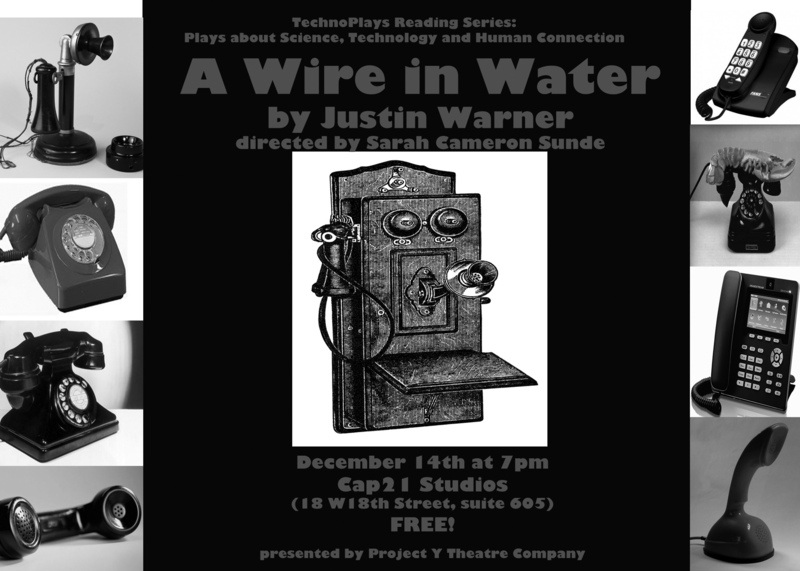 Project Y’s 2014 “TechnoPlays” Reading Series comes to a close this week with a reading of Justin Warner’s latest play, A Wire in Water, at Cap21 (18 W 18th Street) at 7pm on Sunday, December 14th. Join us as we hear our final play in this year! Justin Warner is a playwright, lyricist, and librettist based in New York City. His plays have been produced in over 25 cities, including NYC, London, LA, DC, and San Francisco. He is a member of the BMI Musical Theater Workshop, and a winner of its Jerry Harrington Award for Outstanding Creative Achievement. He is also a Kennedy Center-ACTF winner, a NYC 15 Minute Play Competition winner, a Princess Grace finalist, an O’Neill semi-finalist, and a seven-time Heideman Award finalist. His musicals have been produced, developed, or showcased at the ASCAP/Disney Workshop with Stephen Schwartz, Vital Children’s Theatre, Raw Impressions, Manhattan Musical Theatre Lab, the Triad, the York Theatre, and the Greenwich House Music School Theater Lab. 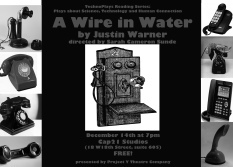 A Wire In Water was commissioned by the EST-Sloan Project and was previously developed at Luna Stage (NJ). Other projects include the musicals The Masked Zinfandel with Peter Yarin, The Passion of Ed Wood with Rob Kendt, and a musical adaptation of Andrew Solomon’s book Far From The Tree with Kristin Maloney and Robert Maggio. Justin is a Lecturer in Expository Writing at NYU, an Associate Artist with AlterTheater in Marin County, CA, and a member of the Dramatists Guild.